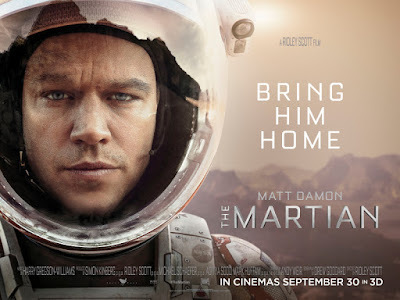 The Billionty-Oneth Geek: THE MARTIAN (THE MOVIE!!!!!!!!!!!)!!!!!!! As promised, just a short follow-up on the Martian, the movie which was released last month. I wrote a longer review of the book (here). The movie is pretty enjoyable, and although it shifts a few scenes around, it stays pretty much true to the book at least as far as big scenes and bullet points go. I mean, there are things that just won’t translate well to the big screen, so they kept a lot off. Specifically, going into details with all the different math calculations and science. They really streamline it all, and show you things, instead of bore you with details. There were a few problems I had with the movie though. I think the main one is the passage of time. They did a good job with Watney, letting him appear more primal as the movie progresses, but pretty much everyone else looks the same. So even though 400 days or so have passed, it just looks like a week to everyone but Watney. The progression of time was also poorly translated in the scenes when Watney had to drive long distances. In the book, it really emphasized how much he hated doing those long drives. In the book, the first drive was just for a few weeks, as I recall. The second drive was supposed to be something like four times that length and he truly dreaded it! The dread didn’t come across in the movie. And especially so because they just lumped that longer drive all into one montage scene, showing both Mars progress as well as Earth progress! It was a feel good moment where in the book, it was one of the roughest of times. They also took out a few of the different disasters that Watney faces during the long drive. So while not exactly the book (and what adaptation is really?! ), it still maintains the spirit of the book and is an enjoyable watch! It’s not a movie of the year or anything, but it’s a fun big budget, low-thinking sci-fi movie that hits the right emotional chords. Until next time, later geeks!